This post is part of a series on trains I saw and/or rode while on vacation in Italy. 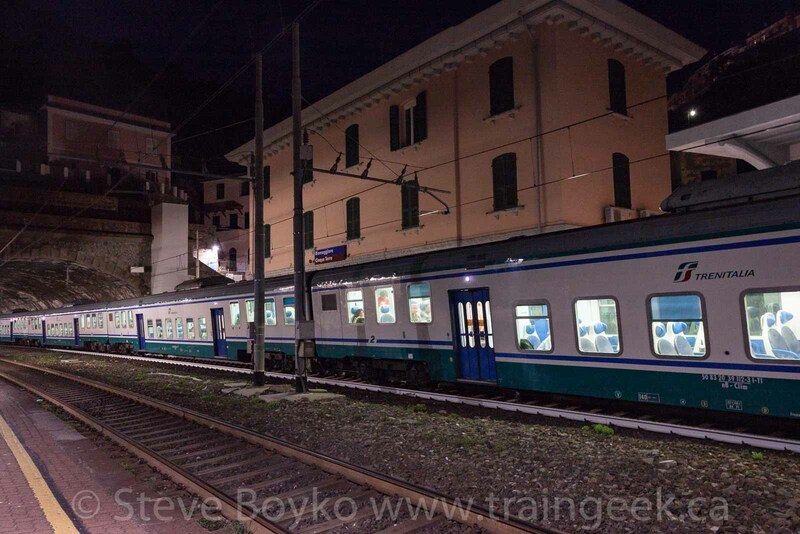 After we had settled down in our hotel apartment not sure what it was for the evening, I went back out to the train station in Riomaggiore, Italy to do a little late night railfanning. 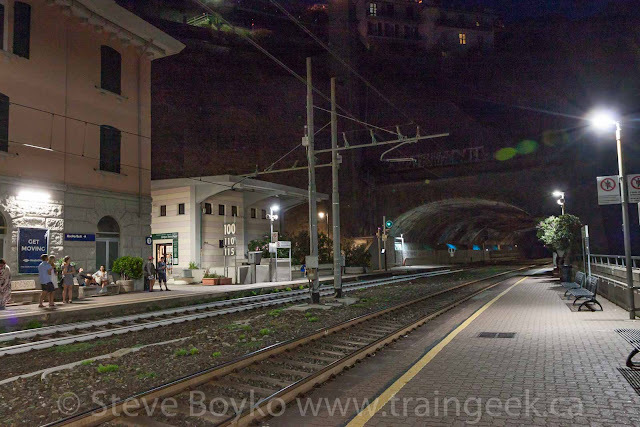 The train station is pretty small - one two-story brick building - with two platforms, one on each side of the two tracks through the town. 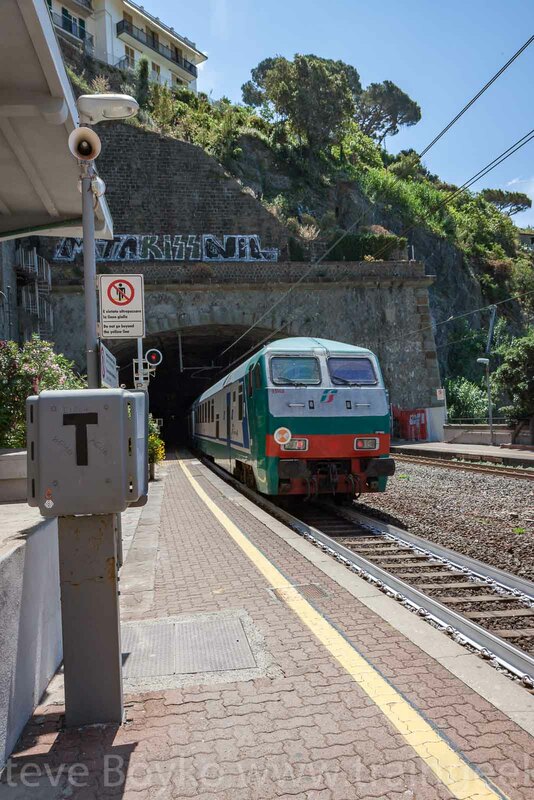 Both ends of the platforms end in tunnels, as the rail line between La Spezia and Levanto runs along the coast and through numerous tunnels. The station itself has a small ticket counter, a few vending machines and a rather small waiting room. I don't know what's on the second floor but it didn't appear to be open to the public. There's a building on the opposite side of the tracks, which is just a waiting room. The two sides are connected by an underground tunnel. Have a look at the photo below, taken late in the day of May 31. The station is the salmon-coloured two-story building partly hidden by the tree in the foreground. 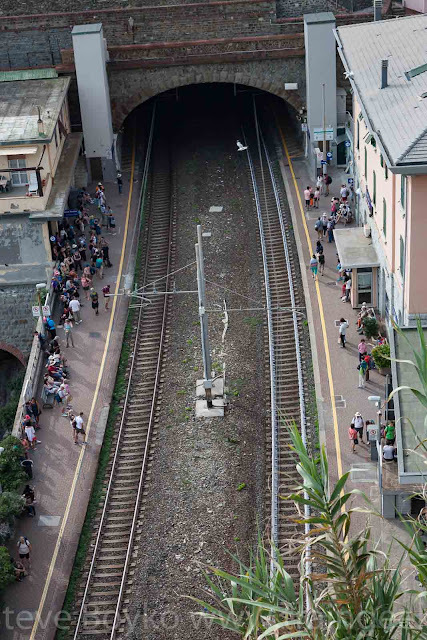 The train is stopped on the platform opposite the station. Note the tunnel at the north end of the platform. This is another view of the station area, looking north. The station is on the right. 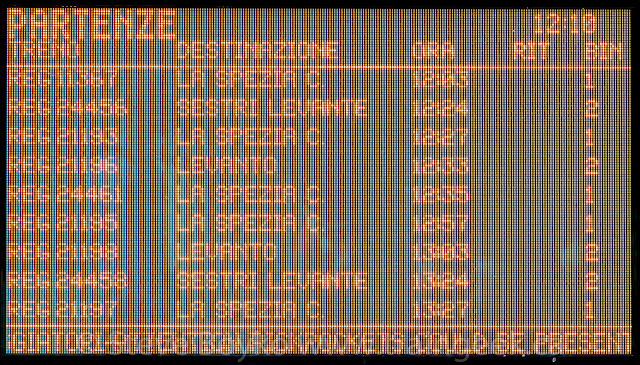 I arrived at the station area at 21:52 and took this (shaky) photo of the arrivals board. 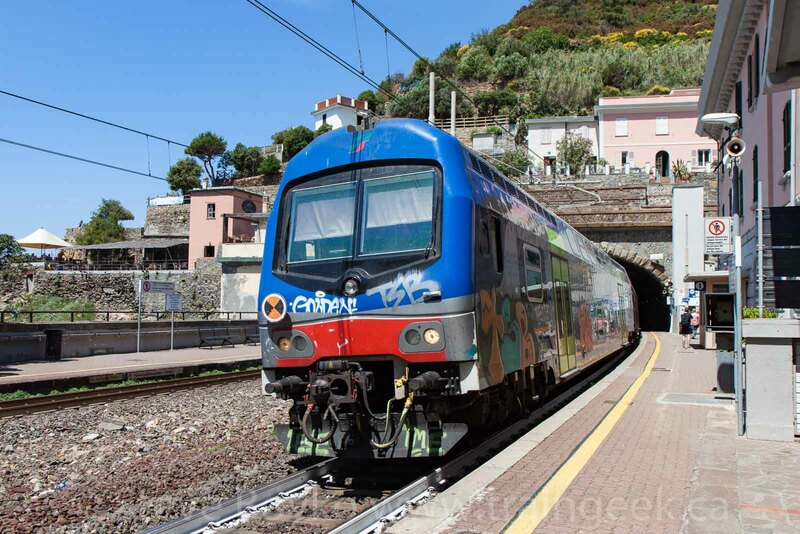 There were five trains due: three southbounds to La Spezia, one northbound to Levanto and another northbound all the way to Genoa. My memory is a little fuzzy on how many I saw. 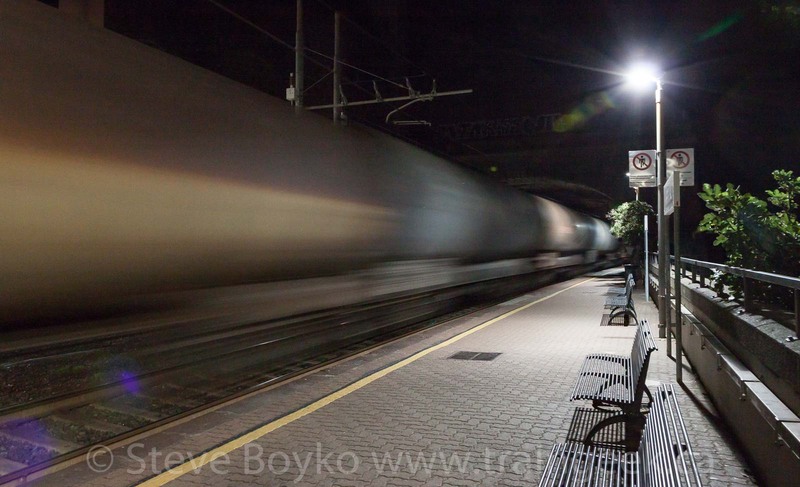 I definitely photographed two passenger trains and recorded one on video... as well as a few freight trains. I don't claim to know Italian signaling at all, but green seems a pretty universal "train is clear to continue" signal. 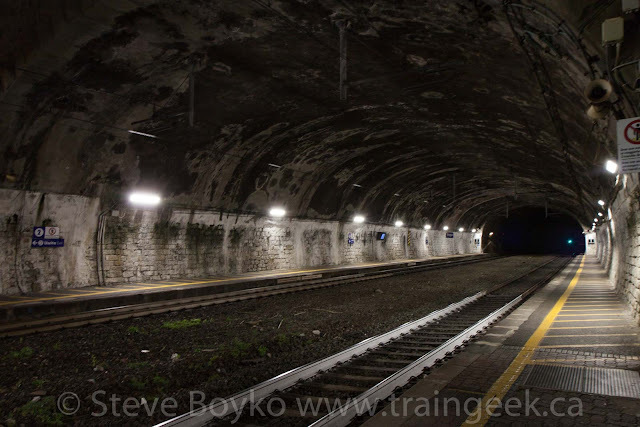 I had a quick look inside the north tunnel - from the platform, thank you. It's not long. 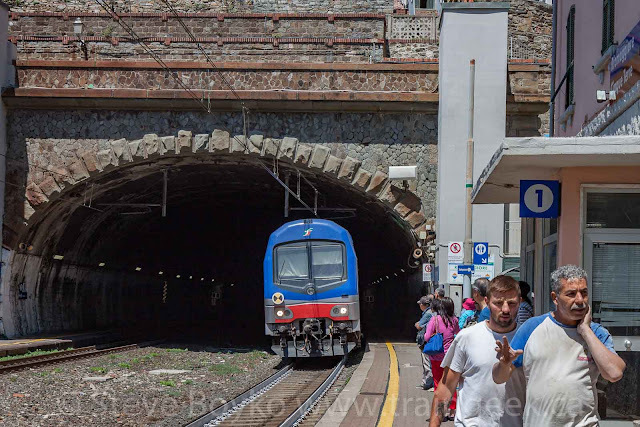 You can see from the lines on the platform that passengers are not permitted to walk through the tunnel. This is a view looking south, showing the train station to the left and the south tunnel in the distance. The walkway from this area to the rest of the town goes over top of the south tunnel, and you'll see later that I took some photos from up there. 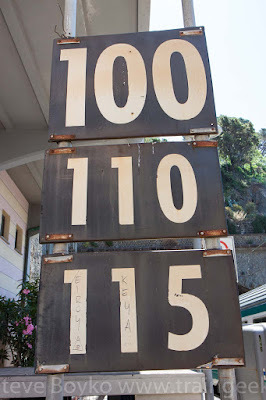 Note the speed limit sign by the station - 100 / 110 / 115 km/hr! I'm not sure what the different limits are for. 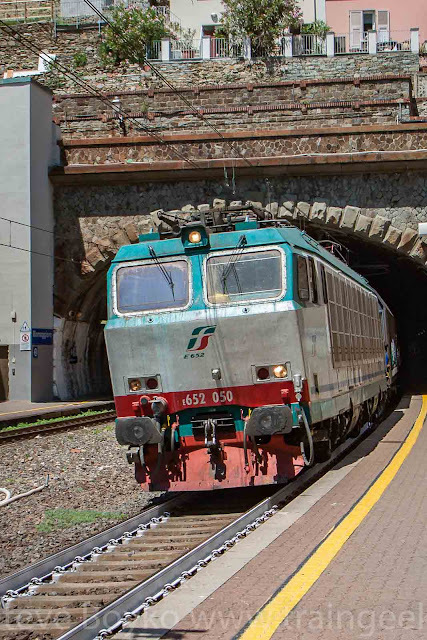 In Canada we have two limits, one for freight and one for passenger trains. 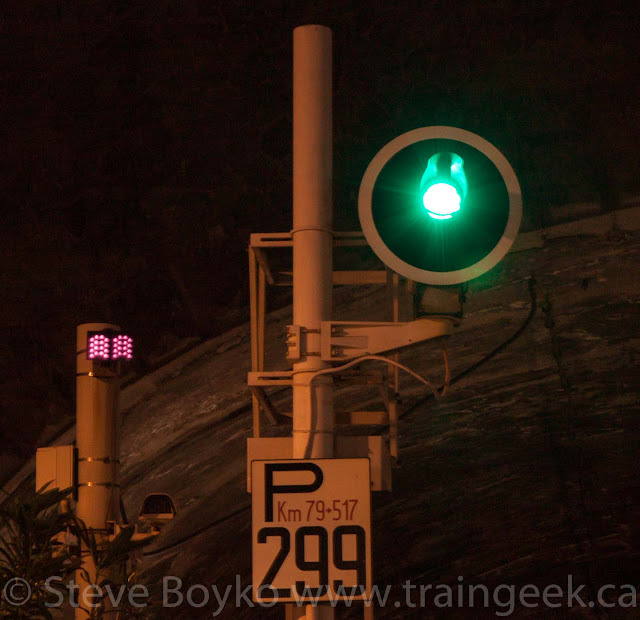 The first train I saw that night was a northbound freight train, towing tank cars. It did not stop. There was an automatic announcement that was broadcast, perhaps 30 seconds before the train arrived. It warned of an express train passing platform 2 and told people to stand back. 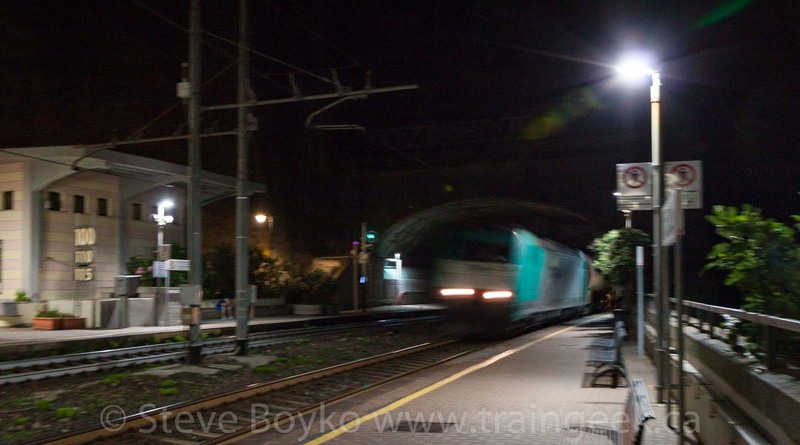 Even at a shutter speed of 1/4 second, the train is a continuous blur. It's a good thing I had my tripod! Seven minutes later, the second train arrived, and this one stopped. 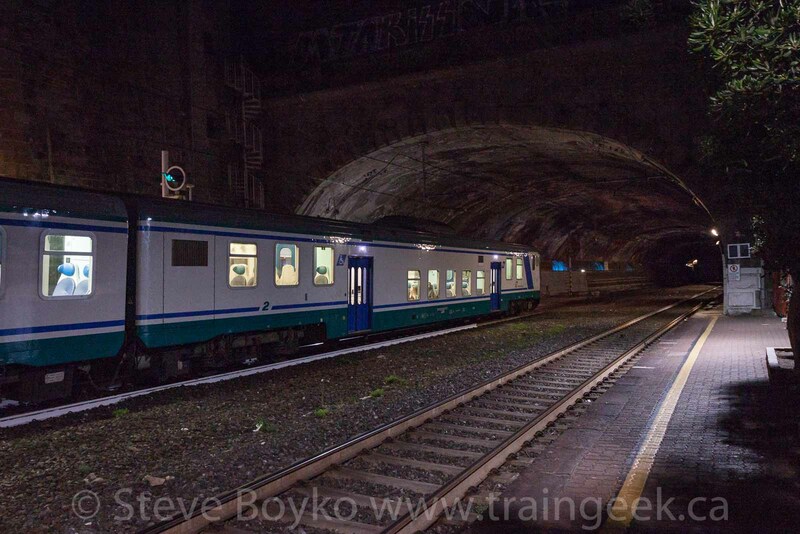 This was a locomotive-hauled passenger train. 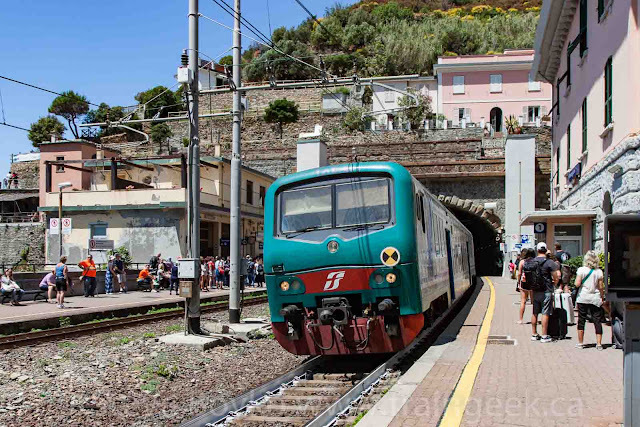 Note the "1" and "2" on the sides of the cars indicating first and second class seating. That was interesting to see. 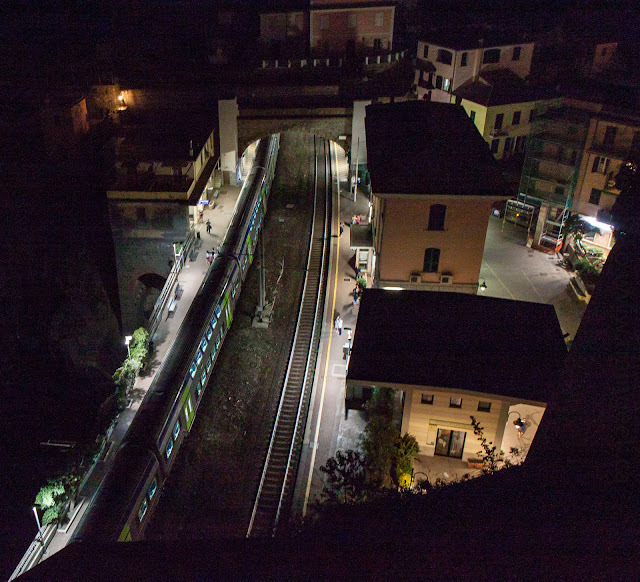 After that train departed, I left the station and went "up above" on the path so I could take an overhead shot of the station and the next train. 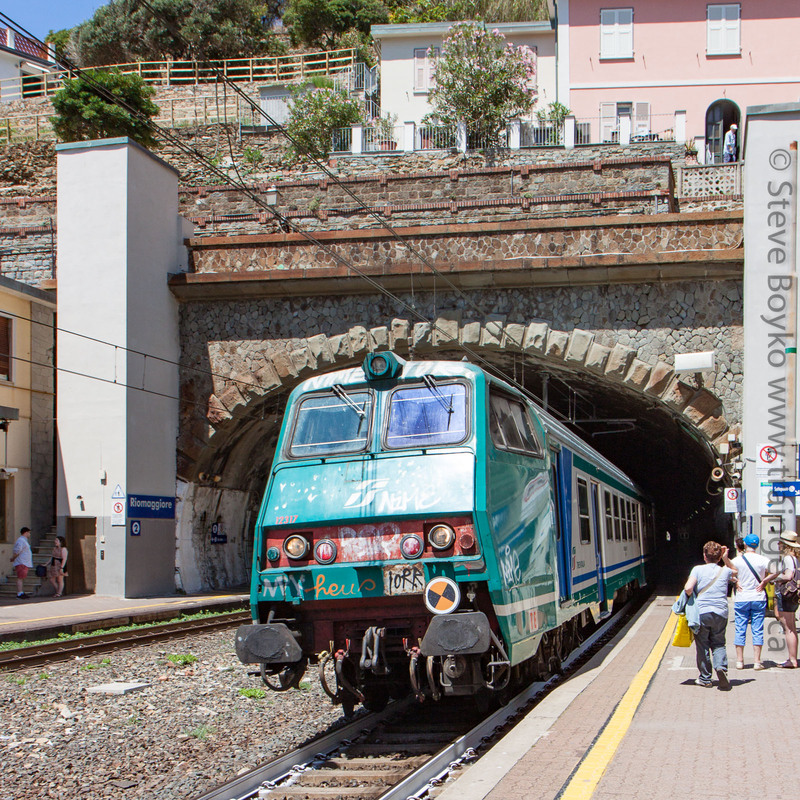 Here you can see the train stopped on platform 2 in Riomaggiore. I also recorded a few freight trains on video. You'll see them at the end of the post. 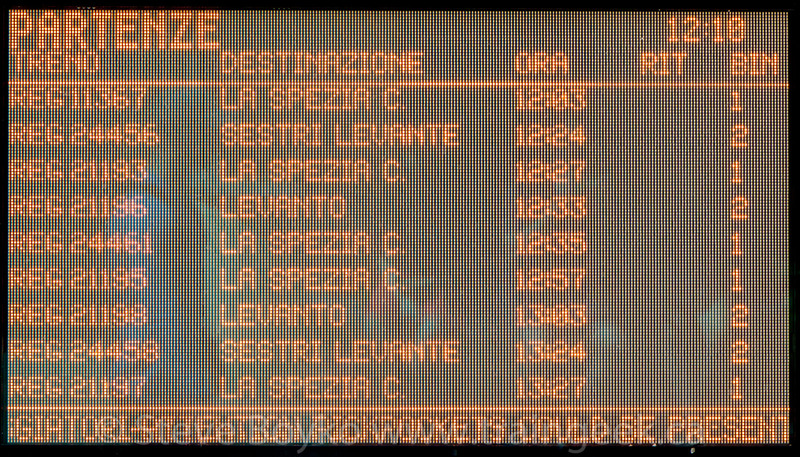 We had tickets for the 12:57 train to La Spezia, connecting with the 13:35 train to Florence (Firenze). We got to the station at 12:10, a little early, as you can see in the display above... which meant railfan time for me! At least it was a nice day to sit and wait for our train. First up was this graffiti-covered train, heading south. It may have been the 12:03 train, running late. Next was another southbound passenger train, led by one of the ubiquitous E.464 locomotives. Here's a better look at the speed limit sign on platform 1. The third passenger train was a northbound electric multiple unit (EMU) train. Not all of these passenger trains stopped in Riomaggiore. The next was the northbound 12:24 train from the schedule, stopping at platform 2. Next, a southbound train stopped at our platform. It was a little maddening to have trains stop, going to where we wanted to go, yet our ticket was for the 12:57 so we had to wait. 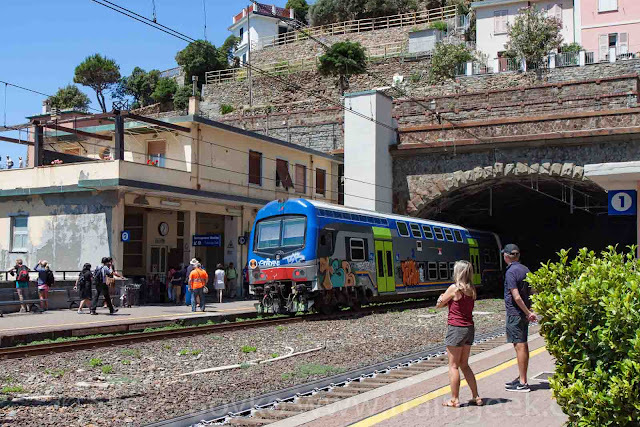 In the end, it didn't really matter whether we waited in Riomaggiore or in La Spezia - we would have had to wait somewhere for our connecting train to Florence. 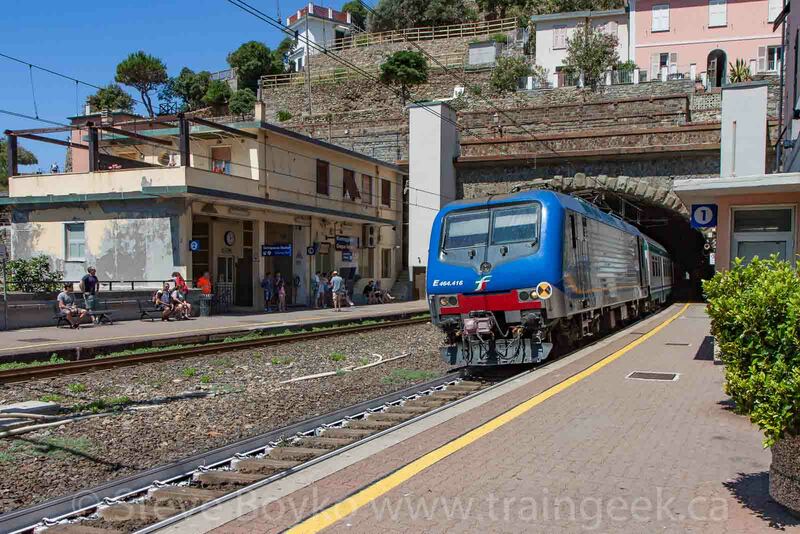 Here's the 12:35 train arriving in Riomaggiore... pushed by another E.464 unit. 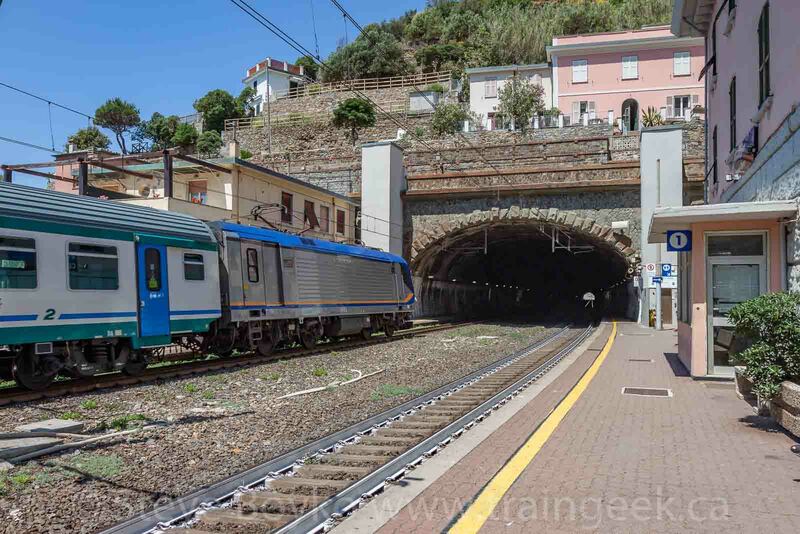 Next was the 12:38 train, seen here departing north from platform 2. Note the graffiti. 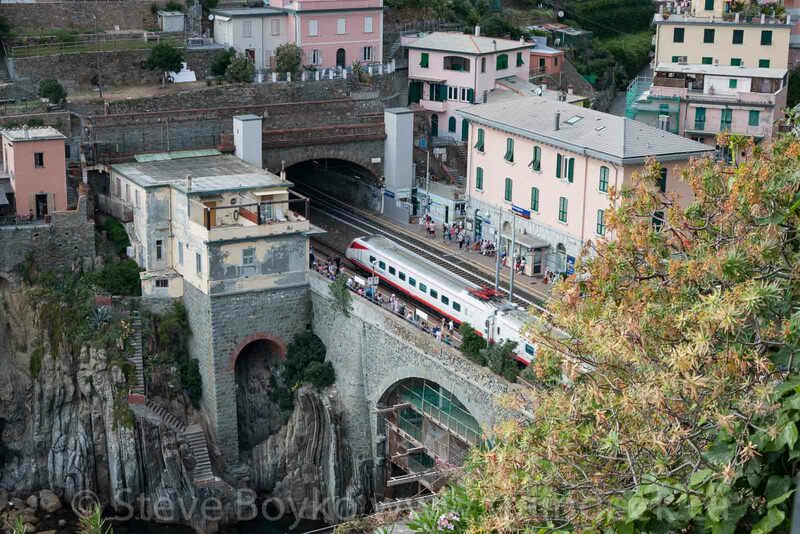 So many trains through Riomaggiore! 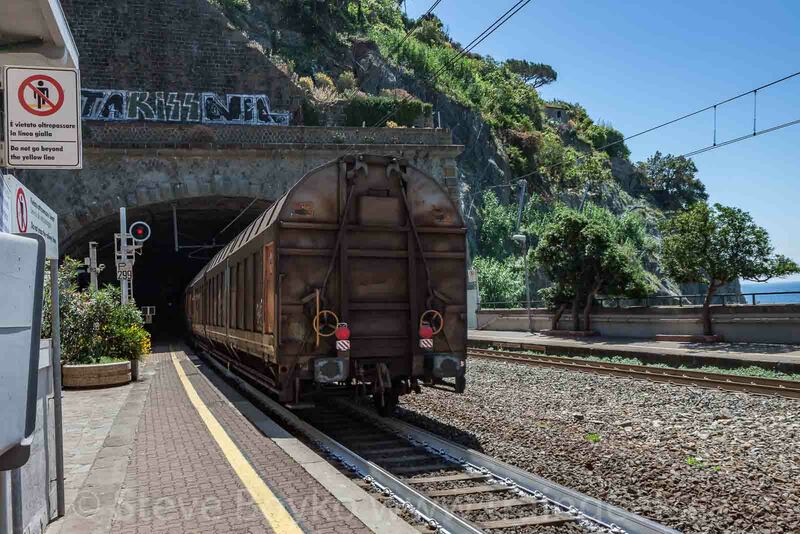 The next train I photographed was a southbound freight train on track 1, pulled by an E.652 unit and hauling a string of what looked like covered gondolas. Finally, our train showed up, right on time, ending a very fruitful Italian railfanning session. The 12:57 - let's go! Here's the video I took at night and the next day.